Taken December 28, 2006, in Vancouver, BC. I'm posting this photo for Carmi's weekly Thematic Photographic project. The theme this week is "sky." This picture, like my other entry this week, was taken on a sunny winter's day. Very pretty! Such delicate clouds, but someone apparently left their giant Corning casserole lid in the lower right corner. *giggles at Margerie's comment* Cute! I didn't notice the resemblance 'til I saw your comment. But I do love the patchwork of clouds across that blue blue sky. Lovely. Who knew you had blue sky, cotton clouds and UFO's in Canada. Do you also have Tuesday Mornings? Sky is cool, but what is the building in it? Is it a Corning lid? Is it a UFO? 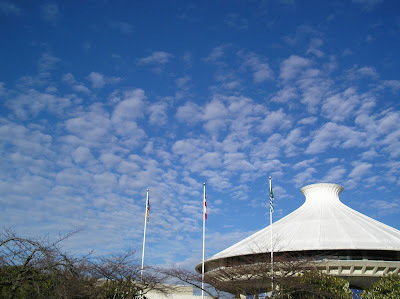 No, it's the Vancouver Museum building in Vanier Park (also home to the Space Centre). But I won't, because those things always make me pukey.